The history of the Deutschmeister Band dates back to the early 18th century. The Royal Infantry Regiment, Hoch und Deutschmeister No. 4 to which the Band belonged, goes back even earlier in Austrian History. When the Ottoman-Turks threatened Europe in the 1680s, the German Order of Knights in Donauworth recruited a regiment of infantry from their ancestral lands and presented it to Emperor Leopold I of Hapsburg. In 1741 when Empress Maria Theresa decreed that every regiment within the Imperial Army should have its own regimental band, the Hoch Und Deutschmeister had already established itself as one of the elite formations within the Army. Thus it was that the Band first paraded for its parent regiment at Milan of that year and played its men into battle at Campo Santo where Field Marschall Traum defeated the Spaniards in Italy. A later decree by the Hapsburg Court Council required that each colonel must support his regimental band without state funds. Many bands were lost from this ruling, and it is indeed fortunate that Count Anton Colleredo, commanding the regiment, decided that his Deutschmeister band was worth preserving. The officers and colonel provided their own funds thereby saving the band. The golden age of the Deutschmeister Band began during the last years of the 18th century, when Emperor Josef II ordered the Band stationed in Vienna, so delighted was he with its quality of music. From this time forward it took on the mantle of the premier musical formation of the Imperial Army, and was required to play at all court balls, parades and related festivals. In the 19th century with the long reign of Emperor Franz Josef I, the Band became even more visible to the Viennese public. All regiments of the Army were required to take their turn with guard duty in the capitol. No matter which regiment provided the guard at Schönbrunn, it was certain that the Deutschmeister Band would be providing the music that day. To this day the Deutschmeister retains a premier status. The Band last played its regiment into battle against the Prussians at Koniggratz in 1866. With the disaster of the First World War, and Austro-Hungary's subsequent defeat and dismemberment in 1918, all bands within the old Imperial Army were required to be disbanded. Such was the esteem which Austrians had come to regard their Deutschmeister Band that public outcry demanded that it be preserved for posterity. And so the Band was retained in civilian-guise to continue the art of playing those wonderful marches, waltzes and polkas which graced the Viennese capital. Many famous works by such noted composers as Johann Strauss, Karl Komzak and Franz Lehar were written especially for the Band. All of these have been preserved in the Band's period performance style which is unmistakable Viennese. The Band uses special instrumentation that most German bands employ, including Flugal horns, and flat snare drums. 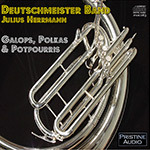 After the end of the Second World War, the Band was again put back together under the guiding genius of Julius Herrmann (1889-1977), its distinguished leader since the 1920s. For over 50 years Herrmann led the Band, preserving its unique style of music in what must certainly be one of the longest and most distinguished careers in military music. The Band continues to this day as a living monument to the splendor of the Hapsburgs and old Imperial Austria.